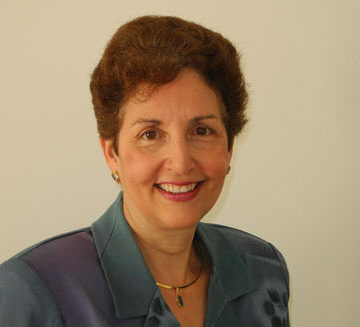 For now, Robin Kemper has the rather cumbersome title of ASCE President-Elect-Elect. It’ll get streamlined this fall when she assumes the role of 2018 President-Elect at the ASCE 2017 Convention in New Orleans, forming an all-female leadership triumvirate with 2018 President Kristina Swallow and 2018 Past-President Norma Jean Mattei. A senior risk engineering consultant for Zurich Services Corp. in New Jersey, Kemper, P.E., LEED AP, F.SEI, F.ASCE, ran on a platform of member value, strategic focus, and efficiency. She was elected to the post by Society members this spring. So, clearly, members feel confident in Kemper’s leadership and vision. But do they know what her ideal vacation spot is? Or that she likes to read about dragons and fire lizards? Probably not. Kemper recently shared more about her life with ASCE News in a fun, lighthearted Q&A. Kemper: When I was in high school I took aptitude tests, and my strengths were math, science, and art. Based on the results of these tests I looked into careers in dentistry (specifically orthodontics), architecture, and engineering. I decided to pursue architecture. During my sophomore year of college [at Rensselaer Polytechnic Institute], we heard stories that the economy was not very good and [how] it may be difficult to get a job in architecture. So, a group of us decided that maybe we should do something more than just the B.Arch that would make us more salable upon graduation. At the same time, we were taking an introductory course in structural engineering from the Department of Architecture. I really enjoyed the course and decided I wanted to double major in architecture and civil engineering. I did not start the civil engineering program until I was a junior, and I when I graduated the next year, I ended up with a B.S. in building science from the Department of Architecture and a B.S. in civil engineering. I stayed on for an M.Eng in civil engineering and snuck in some undergraduate courses I did not have time for when I was an undergrad. I like to joke that “two out of three ain’t bad”; I never did pursue dentistry/orthodontics. Following the path of civil engineering was truly the right decision for me. Kemper: I had a blast doing a feasibility study of the Bethlehem Steel Plant in Bethlehem, PA. We had three teams (architects and structural engineers) each assigned different buildings to determine the feasibility of rehabilitating the various structures for new uses. The oldest structures/remains dated back to the 1860s. Work included using lifts (in the dead of a freezing winter) to observe the exterior walls as part of structural condition surveys, studying the existing drawings on microfiche, and doing research by reading books on the Bethlehem Steel Company and John Fritz. Today the site has a casino, museum, and music festivals among other things. ASCE News: At the end of a long workday, how do you relax? Kemper: I always read before going to sleep. It helps to center and relax me. Kemper: I do not have a favorite book, and enjoy various genres. But I have loved fantasy since I was a child. I was introduced to the stories of Pern, by Anne McCaffrey, in college and the first book I read was called Dragonsong. The series is a combination of fantasy and science fiction with dragons and fire lizards. ASCE News: Would you consider yourself a cat person or dog person? Kemper: We are cat people, but only one at a time. Our current pet is Simone, a 5-year-old gray-haired feline who rules the house. Kemper: We love seaside vacations. Perfect conditions include sunny days with sea breezes, warm water, beautiful beaches, and waves you can body surf. Kemper: Currently one of my favorite shows is Madam Secretary. Kemper: I love to eat salad. I was always a picky eater and I still am to a certain extent. I remember when I was 5 years old, my parents were going away for a weekend, and my brother and I were staying at a friend of the family’s house. My mom told them that they should not worry if I did not eat what they were serving, just give me some salad and I will be fine. Kemper: I do not have a favorite sports team or any sport that I follow. I grew up in a family and married a man who does not follow sports. However, I love the Olympic Games and watch them judiciously. My favorite summer event is gymnastics, and favorite winter event is figure skating. Kemper: The Statue of Liberty – I attended the ceremony on Governor’s Island after the Lady was restored. Kemper: A trip to China. I am thrilled that you will be the next president of ASCE. It seems like Pat Galloway paved the way. 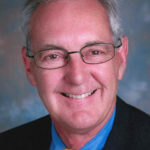 Knowing you from the New Jersey Section I know you will do a terrific job of advancing the profession I was proud to be a member of for 41 years prior to my retirement. 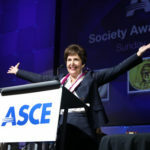 Robin, I am so proud of you and all you have done for ASCE in our Branches, NJ Section and Region already. Can’t wait to see what you accomplish for us all at Society level!!! You were, and in many ways still are, my Professional Mentor. Your friend in Civil Engineering and life in general, Jean. Robin: While I heartily congratulate you I must also share a hope. Your New Jersey Raise the Bar (RTB) related efforts resonated with my and many others RTB work. The unique RTB program began in 1998 when the then ASCE Board of Direction courageously and aspirationally adopted Policy Statement 465 which called then, and calls now, for reforming the formal education and pre-licensure of civil engineers. Almost every board has supported RTB, a movement unique among U.S. engineering disciplines. However, there was a recent lag and I fear it will continue. Without a strong and explicit PS 465, the reform movement will fail. Change is tough and has to be supported at the top. ASCE has always been the leading engineering professional society. Please don’t let it back off on reforming the way CE’s are prepared to enter professional practice (become licensed). Congratulations Robin! We here in the NJ Section are proud that you will represent the NJ Branches and NJ Section as ASCE Society President Elect. As a fellow RPI alumnus, nice to have you running ASCE. Although not formally a Civil Engineer, my career work in public transportation planning and operations has involved me in many civil engineering projects. Like Robin Kemper as 2018 President Elect. Great bio and questions! I appreciate your passing on to Robin a request from a long time ASCE member and ISI member. 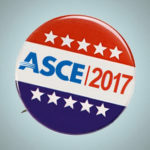 As a future ASCE Society President and leader, members will quickly see and notice your credentials. 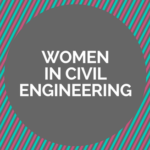 A fairly simple credential that her predecessor, President-Elect Kristina Swallow, has as well as the ASCE executive director, Tom Smith, is Envision SP. The process for becoming an Envision SP through the Institute for Sustainable Infrastructure is pretty straight forward and can be done on-line. I would encourage Robin to show her support now for ISI and sustainable infrastructure by becoming an ENV SP. As a fellow LEED AP, i applaud Robin in taking the time and effort in getting this certification which also sends a powerful message as well but ENV SP should be the credential that all civil engineers especially leaders should obtain to embrace the strategic initiatives of ASCE. Thanks!